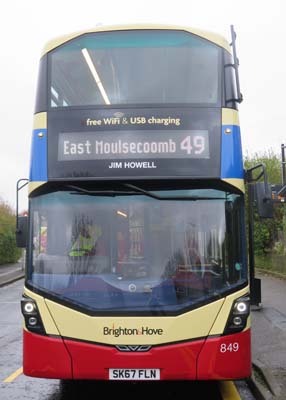 Connections with Brighton and Hove : Jim Howell was one of five brothers born in Essex Street, Brighton to Rose and Jim Howell. Life was hard and when he was old enough he went to sea as part of his grandfathers crew. When the 2nd World war came he went into the Navy serving on a mine sweeper. After the war he went back to fishing, running one of two family boats. After a few years he obtained his own fishing vessel which was moored at Shoreham. In the Summer months the boat was used as a pleasure boat taking people for rides along the Brighton foreshore. He was a much respected person in the fishing fraternity and became chairman of the Brighton Fishermans Club, under the arches. In the 1960s he sailed his vessel, with many others mainly from the West Country, around the coast and up the Thames to Parliment to protest that there should be a 12 mile fishing limit around our coast, he was also involved in obtaining good moorings for local fishermen at Brighton Marina. In 1970 he was approached by the local Fisheries Office to see if he would take up the post of Chief Fisheries Officer for the district from Hayling Island to Dungeness, which he was pleased to agree to. He remained in that position for 22 years up to his retirement. One of Jim's major achievements was approaching the government and obtaining funds to have the fisheries first patrol boats, taking three crew under his wing. He died in August 2013 aged 89. 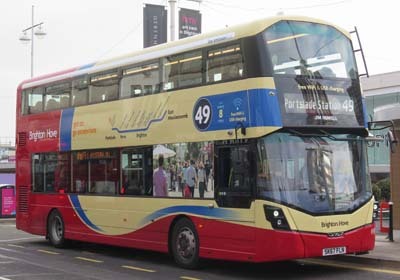 849 Mercedes Streetdeck named since December 2017.